There is something quietly individual about Domaine Zind-Humbrecht from the time you first walk into the purple reception area. We clustered in the area overlooking the vines and waited for a few brief minutes. Olivier arrived, without fanfare; he just opened the sliding doors, stood with his rugby-player frame silhouetted against the sky. And then he began. The next two hours were taken at break-neck speed. He spoke pure, undiluted information without repetition, hesitation or deviation. His opinions were totally clear, well-thought out and conveyed with utter conviction. This is not a man, one senses, who suffers from indecision, or who wavers from his chosen path once he has made up his mind. Although the family has been involved in winemaking since the 17th century, the current domaine began in 1959 with Olivier’s father and mother, and all the wines have been produced at the current cellar near Turkheim since 1992. Anywhere from 150,000 to 220,000 bottles are produced each year. This total is made up of 30 to 40 different wines depending on the Vendange Tardive (VT) and Selection de Grains Nobles (SGN) potential. 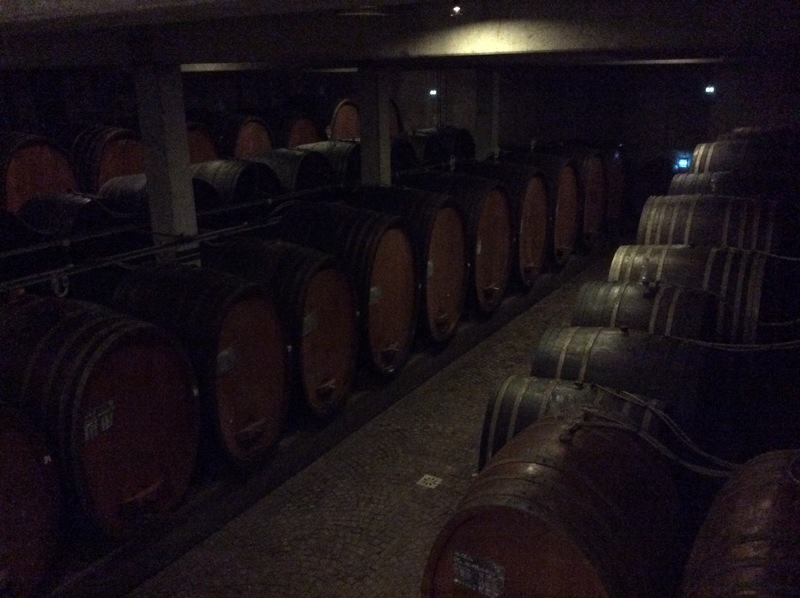 All wines are vinified according to origin and are fermented separately. The availability and size not only of fermentation tanks but also of casks is a perpetual puzzle each year. Riesling makes up around 40% of all wines produced. Pinot Gris and Gewurztraminer make up another 25% each and Pinot Noir, Auxerrois, Chardonnay and Muscat make up the remaining 10%. Olivier has recently started making less rather than more Pinot Noir because it competes with Riesling for the most suitable terroir. “Pinot Noir is a fashion; Riesling is tried and tested”. (However, as he says in a light-hearted way: “I am always very happy to show the Burgundians how to make great Pinot but I have other great wines to make”). He said he would also consider making Syrah but at the moment it is illegal, although the INAO are running tests. His first trial with biodynamic techniques was in 1997 with 6ha. The results were so convincing that he converted the entire domaine to biodynamism in 1998. The approach is necessarily more labour-intensive than traditional wine production; Olivier employs 24 full-time staff, 8 part-timers between January and July and again from September to the end of October, and a seasoned team of about 70 experienced pickers during harvest of whom approximately 80% will have picked at the property in previous years. To operate a biodynamic domaine, staff costs are around 8 times more expensive per hectare than for the average Alsace producer. All grapes are harvested by hand. This is especially important for aromatic, highly phenolic grape varieties; these must not be over-handled. There is no sorting table. The selection is made in the vineyard. (“otherwise it is like saying you can drive faster because you have an air-bag in your car”. Olivier is eminently quotable). He trains his pickers to eliminate questionable grapes as early as possible to avoid contamination of the rest. Rots (with significant emphasis on the plural) are a major issue. He therefore relies on his well-trained pickers. No tractors are used in the vineyards between July and April – except for winter ploughing. Grass cutting between the rows is done with very small lawn-mowers. Grape yields are typically and naturally low, even for a biodynamic producer. This is for three main reasons: one is because the domaine owns a higher proportion of low-yielding hillside vineyards than many; two, because they own a high proportion of restricted yield Grand Cru vineyards; and thirdly because they have low-yielding varietal clones. Grapes are pressed, whole buches – ie: no-destemming – very slowly indeed over a period of from 8 hours to anywhere up to 24 hours. The longer period is especially used for the more phenolic grapes and/or grapes from Grand Cru vineyards. This is in order to extract more flavour (“Good grapes are like good lobsters; you eat from beginning to end” By which we were to understand that you should extract all the flavour by very slow, steady pressing). It also permits you to remove any ‘dirty’ juice. By way of an example, Olivier cited 2006 which was a very bad year for rot and they did select and remove some of the early press juice. The winery is designed to be entirely gravity-fed. There are no conveyor belts; the grapes go directly from the harvesting buckets to the press. Once the juice is in the tank there is only a very short settling time because the juice is already quite clean and also because Olivier does not want to overclarify. He seeks to retain as many nutrients and fine elements as possible for the yeasts to feed on. The cold juice is then racked directly into barrels where fermentation begins. The cooler temperatures are important because these are best for natural indigenous yeasts; warmer temperatures encourage ‘bad’ yeasts. There may be as many as 100 different yeasts of which around 70 can be “a waste of time”. Olivier does not believe in so-called ‘natural’ wines with very low or no sulphur. “These wines can create real problems” by encouraging the wrong yeasts to flourish in cellars. Instead he applies enough sulphur throughout the vinification process to allow 25ppm free sulphur just prior to bottling. He will also use copper and temperature-control to help moderate wild yeast populations. Olivier is not opposed to the use of copper but he is concerned that ‘organic’ production uses so much, thereby effectively poisoning the soil it seeks to preserve. Instead, with his biodynamic methods he uses no more than 1kg/ha/year (very low indeed) to combat chlorosis effectively. And, because the soil is not already saturated with the metal, there is both higher absorption as well as retention compared to ‘traditionally managed’ soils. 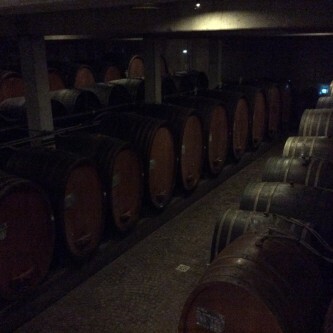 Spring comes to the cellar around June and it is then that the fermentation in the wines begins to pick up again. They will be allowed to finish in their own time – usually between July and October. The length of time is directly linked to the pH and acidity of the wine; low pH being very slow. The speed will also be influenced by sugar levels; very concentrated sugar levels may take an entire year to finish fermentation. The lees at the end of these prolonged fermentations tend to be very fine. They will nourish and protect the wines so these can safely be left for longer without fear of oxidation. During this time the proteins will stabilise. There is usually little need to add sulphur but he likes to have aorund 25mgs free at bottling. Domaine Zind-Humbrecht tend to give all their wines the names of the vineyards or specific site. Grand Cru Goldert Muscat d’Alsace (ie: a Petits Grains) 2013: All the vines were grown by massale selection. Good ripening conditions in July; wet August. Good for dry wines but some rot in October so difficult for sweet wines. (Gewurztraminer was not very successful in 2014 but Riesling and Pinot Blanc were excellent). Muscat d’Alsace is “much more interesting” than Muscat d’Ottonel but needs longer ripening. It does well on fossilitic limestone. Mystery Wine: turned out to be 1981 Goldert Muscat d’Alsace: 1981 was, apparently, quite similar to the 2013 vintage. Remarkably pale and youthful-looking. Many found there to be a slightly minty herbal character to the nose which was followed by a palate of extraordinary youthfulness and fresh acidity. Olivier’s father, Leonard, was the first person in Alsace to introduce temperature control into his cellar. He was also very early (the second person) to introduce the Bucher press and started to work with whole clusters as early as 1986. Riesling 2013 After very bad hail in early August Olivier decided to blend all the vineyards from the Herrenweg which is on the valley floor and has fairly young vines. Bright pale yellow. Bright aromatic style with mix of citrus – lime, peach and even something more exotic – sandalwood ? Fabulous drive and length. Pure fresh Riesling. Riesling Terroir d’Alsace 2013: The grapes in the 2013 vintage of this wine all come from younger vines grown on the granitic soils of the Brand Grand cru. According to legend, apparently the reason these soils tend to be relatively warm is because there is a dragon living in caves deep underneath (!) – whatever, the granite gives the wine a generous, broad structure certainly when compared to the steely, more linear limestone-based wines. Quite tight aroma but more generosity on the palate. Keen acidity. Very young still. Heimbourg Riesling 2013: Olivier explained the Heimbourg is a small vineyard just east of Brand; later ripening; marl-limestone soil brings good acidity, consequently wines can age well. The vines on this site had chlorosis and treatment was being very expensive but after 2 years of biodynamic management it all disappeared. He has worked hard to reduce soil compaction to improve soil drainage. “Chemicals and compaction will kill your soil”. “The soil can be like a locked fridge; you can have lots of food inside but unless you have the key you will starve”. A completely different style! Not immediate hallmarks of Riesling: light spicieness on aroma.. Attractive plumpness on palate but with extraordinary drive of acidity. Nice sense of finest grip on finish – evidence of prolonged lees contact. Lots of future and potential. Riesling Clos Windsbuhl 2011: ripe vintage. Windsbuhl is a cool late-ripening vineyard near top of a hill with Muschelkalk soil – sea-shell limestone. Olivier says it always exhibits very strong character of the terroir. When they bought it in 1988 there was serious magnesium deficiency in many of the vines: yellowing around leaf veins, also stem necrosis. They remain problems of which he needs to be vigilant. Big, ample wine but with so much controlled power and focus – slightly breathtaking. Fresher brighter style than 2011, fairly classic aromatic notes followed by epee-straight acidity on the palate. Super-racy. Whistle- clean, light-footed, poised wine. Riesling Grand Cru Brand 2013: Oldest parts of the GC vineyards used in 2013. Vines older than 30 yrs. They survived the heat and dryness of difficult early 2013 season because of deep root systems. Spice and delicious nectarines (on aroma). Dry, spectacular focus. Powerful but still elegant. Extraordinary! SO much potential for ageing and development. slightly button-mushroom-y on nose but then an initial palate of clover honey, nectarine followed by more savoury notes on the mid-palate and finish. Pretty spectacular especially given age. Then followed a brief discussion about corks and corkiness. A lot of perceived TCA is actually PCA(Pentachloroanisole?) ie: cellar taint. 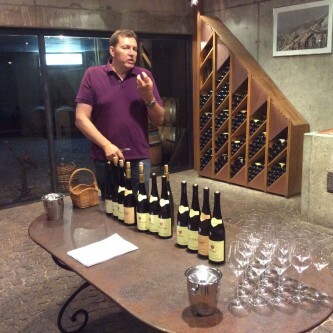 Domaine Zind-Humbrecht are supplied by Amorim who have given a guarantee of zero contamination but each cork costs Olivier an extra 12c compared to ‘normal’ cork. Riesling Clos Hauserer 2008: Very deep marl limestone; oligocene limestone. Named after little path running alongside (actually part of GC Hengst). 2008 cool September; maintained acidity. Limestone is colder soil and gives higher acidity – gives more malic acid than granite soils. Tends towards lack of physiological ripeness. Too much nitrogen in soil can produce oily-petrolly aromas but in good limestone it is only slightly oily with ‘strapping acidity’. By contrast, Granite tends to produce broader more floral aromas and acidity tends to be mostly tartaric. It never really goes fully petrolly. Sandstone: is more like Granite in style but lighter. I don’t seem to have written a note… finding it difficult to keep up at this point! But Helen Savage’s notes say: Intense confit lemon. Flint-tight acid but soft rich centre. Long. Pinot Gris Rotenberg 2013: This vineyard likes to produce sweet wines but biodynamie allows them to pick slightly earlier to make dry. Fine steely nose. But actually needs a bit of limestone rapier-acidity in this (in my humble opinion!) Fat and fine. Pinot Gris Heimbourg 2013: This plot can produce lots of different styles of Pinot Gris. Low yielding vines. Complex nose, some spice from lees ageing? Just lovely drive and fresh acidity. Got the limestone acidity here! Pinot Gris Rangen de Thann Clos Saint Urbain GC 2013: Volcanic soils. Most southerly vineyard, high altitude. Late-ripening. Layered, surprisingly elegant – with all the aromatic spicy Gewurz hallmarks. Amazingly layered and light-footed for a Gewurz. Weak-at-the-knees gorgeous (! sorry but that’s what I’ve written!). Ripe nectarines, rose petal, fresh lychees and really strongly and, most deliciously, fresh ginger! Just lovely. Long. Gewurztraminer Windsbuhl 2013: late-ripeneing site hence good acidity – plus rocky limestone soil. Slightly closed but with a slight smokiness? Quite sweet given the limestone soil acidity (34 grms residual). To me, less expressive than expected but will expand. At this stage we were late for our next appointment and were trying to say thank yous…. I seem not to have managed to write a note at all but Helen has kindly contributed hers. Helen’s note: Intense and very complex aroma – a mix of spice and dried petals. Still sweet, with real intensity. Like drinking perfume, but with mineral finish.